Daina De Prez is a piano entertainer and Twin Cities musician with a long history of successes and many thousands of satisfied audiences. She is a dedicated entertainer providing a wide range of skills and experiences to her guests and audiences. Among her many talents are dueling piano player, cabaret performer, band leader and award-winning singer and songwriter. She’s also gained recognition for her talents as a playwright, musical director and arranger, an artist, writer, and recording artist. De Prez has a long history of providing exceptional service and beautiful artistry. She is a natural born entertainer and, at heart a renaissance woman who has dedicated her life to perfecting her craft. It’s easy to see just how much she loves what she does. Throughout her nearly 40 year career, De Prez has received raving results from an expansive number of successful events spanning the globe as far as Norway, the Caribbean Islands of Barbados, Virgin Gora, St. Maarten and Aruba, and Amsterdam. In the United States, De Prez spent a great deal of time on tour doing shows in San Francisco, Washington, D.C., Richmond, Virginia, Raleigh, North Carolina and the Midwest. Daina De Prez continues to expand her experience and is continuously exploring new opportunities. It is likely that you will see her in some form in various destinations throughout the United States and around the world. Watch here, at her website, for upcoming events and venue performances. Though talented in a multitude of arts and styles of music, Daina De Prez has a love for The Blues. He repertoire, though, is impressive including every type of music from the 1960s, 70s, 80s, 90s, and today. Her love of music and skill expands nearly a century of styles from classic to the most modern. This allows De Prez to tailor her experience to fit virtually any audience, theme, or venue ideally. 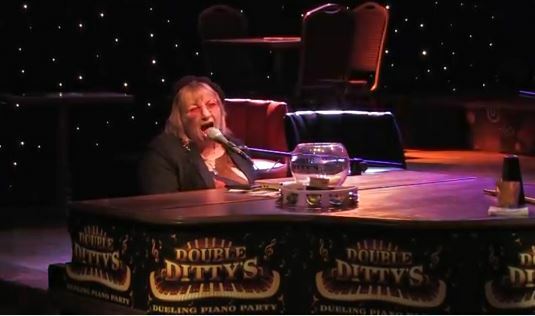 Daina De Prez spent much of late summer in 2015 performing in a one-woman show, “Memories of Janis.” The show was performed at the Bayfront Blues Fest in Duluth, Minnesota. The event earned De Prez rave reviews and three standing ovations. She also earned a front page feature on the Duluth News Tribune. In speaking of the show, she said, “I don’t think I brought enough CDs!” And, her CD, “Memories of Janis” sold out at the event. Daina De Prez is currently taking the success from her 2015 event and turning that energy into a new release. She is currently working from her home recording studio in Minnesota to record her next CD. For the last 30 years, De Prez has called Minneapolis, Minnesota her home. In Minneapolis, she has a running show at Nye’s Polonaise Room from the piano bench. Prior to launching this event, she spent 10 years touring the United States performing piano music among other varied styles. A diverse and dedicated professional, Daina has long had a passion for performing and providing exceptional quality experiences for each guest that attends her events. A “Daina Show” provides those in attendance with the ability to not just watch the events but also to become a part of the show. This stems from her early love and ability to command the stage at any event. She is quite aware of the room and capable of capturing attention quickly and maintaining it. Additionally, her wry wit and impressive improvisation has allowed her to enhance and fascinate audiences throughout the world. Guests at any of her shows often say they are transported from their day to day life to a different world for just a short while during the event. Dedicated to learning and growing, De Prez is also one to spend her time enhancing her skills and growing her talents even further. You will find her experiencing the latest tunes or diving into older, traditional pieces to further explore her opportunities and her skills. There is something magical about what Daina De Prez provides to her audience. Whether you come for one of her dueling piano performances or you hope to capture one of her other musical talents, there is always something special and memorable about each one. De Prez is continuously interested in hearing about new and upcoming events and opportunities. Get in touch with her if you wish to learn about an upcoming event or you wish to talk to her about your opportunity. Always the entertainer, Daina De Prez seeks to provide her audiences with an opportunity to step away from the difficulties of day to day life and to step into a world of entertainment, beautiful music, and outstanding opportunities.